FREMONT, Calif., Jan. 25, 2017 /PRNewswire/ — The field service industry supplies the hands and brains that keep America’s backbone functioning. Whether it is at some level of government, or in the commercial or residential sectors, this country depends on the men and women that make up the legions of field service personnel that repair and maintain the nation’s infrastructure. Rugged computers, whether notebooks or tablets, make it possible for these individuals to successfully work outside – literally and figuratively – away from an office. They provide versatility and mobility. And most importantly, they are designed and built to operate in environments that commercial computers would never survive. GammaTech’s DURABOOK rugged computers are specifically designed to meet challenges and provide cost effective solutions for field service professionals’ mobile computing needs. GammaTech provides the field service industry with one of the best lines of rugged computers – the DURABOOK. DURABOOK has long been a trusted name, resource, and partner within the industry. Its well-known reliability and ruggedness make it the ideal choice for field service applications. Further setting DURABOOK apart from its competitors is its ability to provide more advanced configurations and offer a more complete solution through its famed customization program. 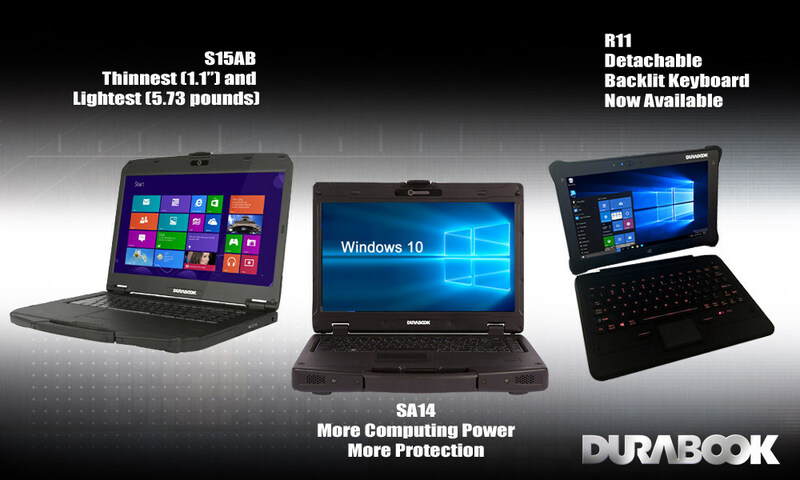 Wang specifically mentioned three DURABOOK models that are ideal for the field services industry: the rugged R11 tablet, and the rugged SA14 and S15AB notebooks. Each, he said, offers the functionality, durability, capability, and mobility necessary for field service workers to do their jobs. The R11 features a dual RFID option that provides a wider user scenario as well as more productivity and flexibility. A special reader board offers a feature set that supports both low and high frequency technologies simultaneously. Its native CCID (Circuit Card Interface Device) implementation supports Windows®, LINUX®, and Mac® operating systems, eliminating the need to install special drivers. The R11 also has the ability to support 1D/2D barcode scanning with higher resolution and reading ability, immensely increasing productivity. It has a class-leading motion tolerance of 400 in/s that delivers a distinct performance advantage, resulting in snappier scans and less hassle. Its highly visible and safe LED-based aimer is ideal for customer-facing applications. Backlit keyboards and sunlight-readable displays, found on R11 and SA14, are especially welcomed by field services workers operating in bright sunlight or under glaring-lighting indoors. All three models meet MIL-STD-810G rating, which assures shock, drop and vibration protection, as well as the ability to withstand use in a wide range of temperatures. They also have various IP ratings to ensure there is no water and dust intrusion. The R11 also carries an ANSI ISA Standard 12.12.01 certification, meaning it is fit for use in hazardous locations. In other words, they all come survival tested and ready for action. The advanced Intel CPU included in SA14 ensures top-notch field performance by providing 10% more CPU performance and a huge 22% increase in memory performance as well as 1.5 hours longer battery life. It also includes Intel® HD Graphics 520 that features ultra-low-voltage power consumption, a significant improvement compared to Intel HD 4000. The unit’s Advanced DDR4 represents more efficiency and more speed than DDR3, using up to 20% less power while being twice as fast. Mobility is a key ingredient in a rugged computer. After all, if the unit cannot be easily taken to the worksite and be able to function as a computer in an office setting does, it isn’t much good. The SA14 offers the latest Wi-Fi/Bluetooth chip and dedicated GPS software, and support LTE high-speed wireless communications to provide real-time information exchange between the worker in the field and other locations. Both R11 and SA14 also offer vehicle and dock options that support RF pass through for seamless work as it happens. Weight is also a prime consideration when selecting rugged computers for field services endeavors. Both the R11 and S15AB are the lightest models in their respective categories: R11 is just 2.7 pounds, and the S15AB is only 5.7 pounds, despite having a large 15.6″ display. GammaTech’s DURABOOK rugged computers for the field services industry are available through authorized resellers nationwide and at www.GammaTechUSA.com. All three models are covered by the DURABOOK Peace of Mind (POM) three-year warranty. As with all GammaTech products, these also may be customized to customer specifications.